She is young, bubbly, sassy and perhaps the most precious find for the Telugu Film Industry in the recent years. It's Colors Swati for you, who brought a young presence to the small screen with her chat show Colors on Maa TV couple of years back. The year 2008 proven to be lucky for this Visakhapatnam girl. Besides stabilizing her position with Tollywood in the role of Lavanya in Ashta Chemma she also stepped in to Kollywood with Subramaniyapuram. Currently riding high on the crest of success wave, Swati gives an exclusive interview to idlebrain.com. Here are the excerpts. I was born in Vladivostok (USSR). My father worked for the Indian Navy and he was then posted in USSR as a submariner. The Russian lady doctor named me as ‘Svetlana’ which means ‘beautiful girl’ but mom changed it to Swati. We shifted to Bombay and then we moved to the Eastern Naval Command in Vizag. I spent most of my childhood in Vizag. We shifted to Hyderabad when I was in my 11th standard. I had some free time after EAMCET and my aunt Lakshmi Medapati was doing a program for MAA TV and she wanted me to do a promo. I was not interested. I was not very familiar with Telugu as I was brought up in the Naval community where we would communicate mostly in Hindi and English. She took me to the studio and the make-up irritated me. They asked me to talk about movies. I talked about Spider man, Vizag beach and necklace road. Everybody started clapping after I finished the test and I wondered why. Adavi Srinivas from MAA TV called my mother and told her that he is planning a program called ‘Colors’ and wanted me to host that program. I started it as time pass and did more than 150 episodes. It started with a 30 minute slot on Wednesday. Then it was shifted to 30-minute slot on Saturday. With the popularity it gained, Colors program was given 1-hour prime spot on Sunday in less than two months of its first episode. I joined bio technology course at St. Mary’s in Yusuf Guda. I liked the atmosphere in that college, because they do not give any extra attention to celebrities and popular faces. I did quite well in studies and am extremely thankful to all my teachers, especially my chemistry teacher Shobha ma’am and the prinicpal Mahender Reddy of St.Mary’s who always supported and encouraged me. I got many film offers the moment I started anchoring Colors program. I had just turned 17 then and I was too young to do films. I had zero inclination towards acting in films. I wanted to finish my graduation. At the same time I kept my loyalties to Colors program and MAA TV. Every program comes with a shelf life and I decided to discontinue Colors program when it was highly popular. After completion of 1st year of graduation, I got an offer to make my debut in Danger. It was a nice package to debut. Krishna Vamsi had taken permission from my principal. After 2nd year, I accepted AMAV (Adavari Matalaku Ardhalu Verule). After 3rd year, I did Subramanyapuram (Tamil) and Ashta Chemma. I wanted to become a doctor, and once when I went to the circus as kid I got so overwhelmed with it that I wanted to join the circus and run away with them. I also loved the way lady naval officers looked in their uniforms. I wanted to join defense. Now I realize that I landed in the right profession because I will get an opportunity to do all the roles I aspired to become. 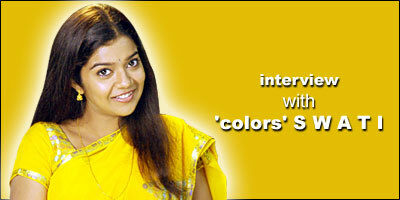 Do you like being called as ‘Colors’ Swati? I do agree that Colors got me immense recognition. But I want to be called as Swati. I would like to have an identity for myself. I don’t want people to associate me with any of the work I have done. When people call me ‘colors’ in public, I refuse to acknowledge them. What is the difference between anchoring and acting? In colors program, only two people are involved. One is me and the other one is the caller. But, our conversation should entertain many people who are no way connected with both of us. In order to entertain, I had to appear highly energetic and hyperactive. And just because I appear hyperactive, people might think that I am that kind of a person in real life. I could speak crazy stuff and get away with it in ‘colors’ program. But acting is more serious and complex job. So how different is real Swati compared to the characters you have done on TV and big screen? I am a bundle of contradictions. It also depends on the person I am with and the mood I am in. I am little bit of every thing. I have completed my graduation. All the directors I have worked with have advised me not take my talent for granted and had asked me to give acting a serious shot and now I have decided I should continue working in films. It is very difficult to reach the position I am in now. I should make use of it. I did four different characters in four films. I am proud of them. How do you do acting? The whirling sound of camera when it rolls is the one that triggers the actor in me. I go to a different space when camera rolls. I feel that filmmaking is a team work. All of us should contribute our best in order to make a film happen. Even if a light boy does a bad job, it reflects on the film. One individual can cause damage to the entire product. Hence I try to be perfect on my side all the time. Which is the most watched film among yours? I watched Asta Chemma five times. I remember watching Ashta Chemma in a packed theater for 10:30 pm show. We did not have a place to sit. We were standing and looking at the reactions of audiences instead of watching the screen. It was such a gratifying experience watching the audiences getting entertained by our films. Ours is a closely knit family. I have an elder brother Siddharth. My dad works for the Merchant Navy now. My mother always stood by me. My parents are very supportive and very friendly. There is lot of communication among us. I am blessed and very fortunate to have such a supportive family. Touchwood! What is your take on gossips? People think that films are easy but it is the exact opposite. Most people’s lives thrive on films (watching and gossiping). Ours is such a field where anybody can criticize. I do take criticism in the right spirit but it also depends on who is giving it and I am growing to a level where I am not perturbed by malicious gossips. Are you a fan of Mahesh Babu in real life too? I am not a frantic fan to anybody. That kind of obsession comes in your teens. I was in showbiz in my teens years and I got a chance to meet all the film celebrities personally. Your best work till date? I give my best to all my films, each one is special in its own way. You dubbed your voice to Ileana in Jalsa. Tell us about it? I treat dubbing as a valuable profession. I feel that it is as challenging as acting. I do perform while doing dubbing in a dubbing theater. I prefer lazying around at home, reading, writing and doing my own thing. I loved reading Gone with the wind, Crime & Punishment, Anthem and am still reading Anna Karenina. I read books of Sidney Sheldon, Robin Cook, Jeffrey Archer, John Grisham, Arthur Hayley, Lin Yutang for light reading but I also love reading Paulo Cohelo, Ayn Rand and many more, the list can go on. If I like a book by an author, I try and read the entire collection of that author, though it’s not easy and I enjoyed the entire collection of Harry Potter. I do blog. But I don’t want to reveal the address of my blog. I do blog when I am upset or happy. I love writing long e-mails to communicate and to stay in touch, but only to friends and dear ones. What is your opinion on movies made on books? It depends. Ashta Chemma was beautifully interpreted, all thanks to Mohan Krishna, but usually we get much bigger impression when we read books. I saw the Harry Potter film. But I like Harry Potter book much better. What kind of films did you watch when you were kid? Mary Poppins, Sound of Music, almost all the films by Mani Ratnam, Arth, Damini, Mausum, Mr. India and Kshanakshanam to name a few. Mr. India, Anjali, Mayabazaar and ET were my favorite films when I was a kid. What kind of films you want to do in future? I am getting very good offers but most of them are coming to be with a preconceived notion that I am capable of doing only certain kind of roles. I don’t want to go by public image. I want to do different films. It changes with movies. I like certain actresses in certain films. I request everybody not to encourage piracy. Thank you.